Encircling Atlanta through portions of Clayton, Cobb, Dekalb and Fulton Counties, Interstate 285 comprises a 64 mile long beltway. Notorious for heavy traffic and congestion, the beltway provides part of a bypass for through traffic avoiding Downtown Atlanta. The Perimeter Highway is not necessarily the fastest route through the Atlanta area due to heavy commuter and truck traffic. Traffic counts collected on the beltway by the Georgia Department of Transportation (GDOT) in 2016 topped out between Exits 29 and 30 at 243,000 vehicles per day (vpd). The development of the Perimeter Highway in the 1960s led to a suburban boon, accelerating growth in the metro area, and turning I-285 into a commuter route. The full loop was open to traffic in July 1970.1 Notable upgrades along the Perimeter Highway during the $1.4 billion "Freeing the Freeways" megaproject included the rebuilding of the full cloverleaf interchange with Interstate 85 to the northeast into a four-level interchange. Completed in September 19872 and formally known as the Tom Moreland Interchange, locals refer to it as Spaghetti Junction, due to the series of flyovers that come together within the exchange. Interstate 285 westbound at the tunnels across the south side of ATL Airport. Photo taken 06/30/17. Variable speed limit signs along the inner loop of Interstate 285 at Spaghetti Junction (I-85). Photo taken 07/02/17. The Transform 285/400 project at Sandy Springs upgrades a low speed directional cloverleaf interchange with left-hand ramps into a high-speed junction with flyover ramps and collector distributor lanes. 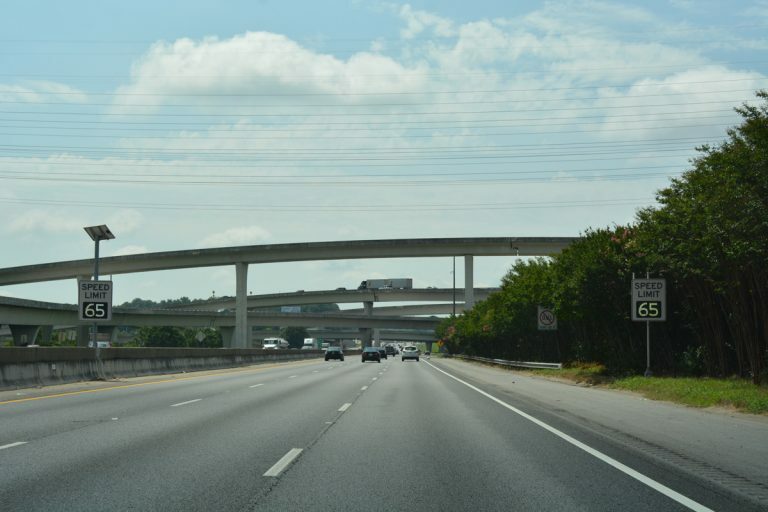 Additionally, expansion and improvements are being made along both a 4.3 mile section of I-285 and 6.2 miles of Georgia 400. Estimated to cost $800 million, major construction runs from February 2017 through 2020. Bouldercrest Road north at Interstate 285 near Gresham Park in Dekalb County. This assembly was replaced later in 2007, with that assembly subsequently replaced by 2012. Photos taken 05/29/07. Bouldercrest Road north at the on-ramp for I-285 west. Interstate 285 uses east/west cardinal direction banners south of I-20 in Dekalb County. Photo taken 05/29/07. "Happy Birthday to the open road." Gwinnett Daily Post (Lawrenceville, GA), June 25, 2006. "Rebuilding of Brookwood interchange expected to be finished in October." The Atlanta Journal and The Atlanta Constitution, August 22, 1986. 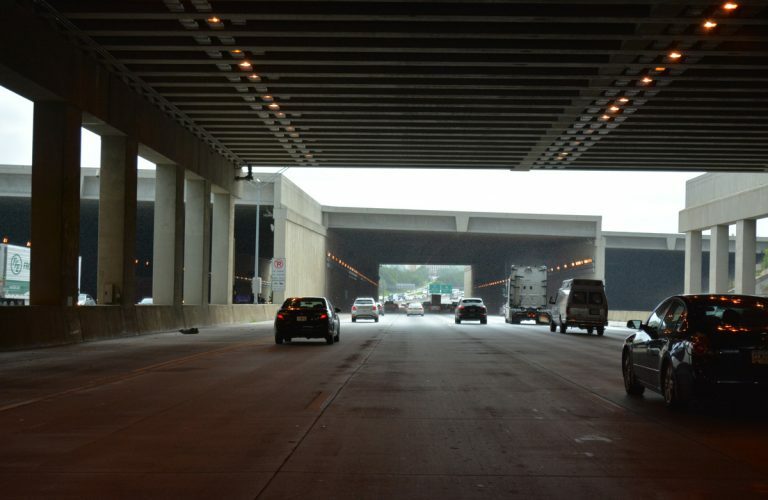 "Light at end of the tunnel for Interstate 85 construction." The Atlanta Journal and The Atlanta Constitution, September 17, 1987. "Cleared for Landing Atlanta toasts airport's fifth runway Strip to cut delays, boost flight capacity." Atlanta Journal-Constitution, May 17, 2006. "Hartsfield-Jackson Expansion: Runway in the sky - Giant bridge over I- 285 under way." Atlanta Journal-Constitution, March 13, 2004. "Variable speed limit signs to go up on I-285." Atlanta Journal-Constitution (GA), September 20, 2012. "GDOT upgrading variable speed limit signs on I-285." WSB-TV (Atlanta, GA) April 6, 2016.